An Isle of Man teenager has been sentenced to a total of three years and nine months for dangerous driving. Brandon Gowland, 18, from Onchan pleaded guilty to causing death by dangerous driving and causing injury by dangerous driving last March. Brad Campbell, 17, also from Onchan, died when a Renault Clio driven by Gowland crashed in Foxdale last year. During sentencing, Deemster Alistair Montgomerie said: "This has been a tragedy for everyone." "The constant theme was speed- you were showing off your recently purchased car and you took a number of risks in the way you drove. "Having seen photographs of the crash scene, I regard it as miraculous that any of you survived." The court heard on the night in question Gowland had been driving three passengers in his car on the A24 Foxdale Road. It is thought he reached speeds of about 75mph in an area that defence counsel described as an accident "black spot". Gowland, who lost control of the car before crashing into a road-side cottage, was still classified as an R-plate driver- a fact that restricted him to driving at speeds no faster than 50mph. 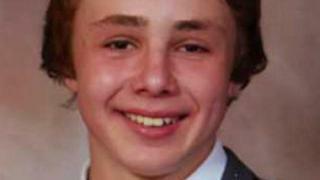 Brad Campbell, an apprentice plumber, was found by paramedics in the back seat of the car at about 00:10 BST on 24 August. He was pronounced dead at the scene. The Isle of Man constabulary said: "Brandon Gowland is a young man, who, at just seventeen years of age, drove a high performance car in such a dangerous manner that he lost control, caused the death of one passenger, seriously injured another, and significantly injured the third. "In doing so, he has had to face the consequences of his actions but no sentence will bring young Brad Campbell back to his family. "Perhaps his legacy can be that his tragedy will serve as a stark reminder to others of the immense responsibility expected when using the road". Gowland has also been disqualified from driving for seven years.